I've downloaded a new skin/sound, now how do I open it? How do I install new sounds? How do I make the game run under Windows XP? How can I edit the in-game text? How can I edit the in-game music? How can I Prevent the game crashing? A skin is the image that is "mapped" onto a 3D object. This makes the object "life-like" and adds the colour and texture to it. 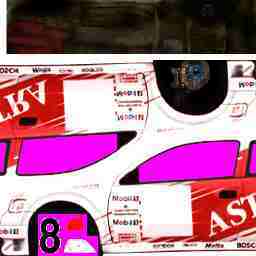 Below is the same part of the Vauxhall Astra skin, except for the fact that it has been altered to give it a new look. The author of this skin (Christophe LOGEL alias TOTOF) has changed the original to make it look like the Opel Astra Trophe Andros version. The skins in Rally 2000 can be edited very easily using any good drawing package. The popular choices are: Adobe Photoshop and JASC Paint Shop Pro. All of the skin and sound files on this website are stored in the .zip format. The .zip format compresses the skin or sound file in order to make it smaller. In order to view the skin or sound in the .zip file a utility program is required. There are a number of these availble (Just search for "Zip Utilities"). I would recommend WinZip which can be donwloaded from www.winzip.com. Once you have opened the .zip file you need to install the skin so that it will work in the game. Some skin designers do not create seperate gravel version parts for the skin and just use the normal parts. If seperate gravel parts have been made then it will have been made clear. Remember to always check the readme.txt if one is included with the skin. The folder listings above show where the majority of sounds go. Most downloaded sounds say where they need to go in the the readme.txt included with the .zip file. Many people have had problems running Rally 2000 in Windows XP, with the help of some guys at High Gear forums I have compiled the below information. Firstly you will need to download and install the Windows Application Compatibility Toolkit from Microsoft's website, this is a 6.62Mb download. Save the file somewhere safe. It is named "act26". Run this application it will install various components and give you a shortcut in your programs group to the "Windows Application Compatibility Toolkit" strangely there is no shortcut to the program we need to use. You will have to search your HDD for the program "QFixApp.exe" and run it, then follow the instructions to use the QFixApp tool to apply this fix. 1) Select "Ral.exe" as the file you wish to apply this fix for. 2) Under the "Fixes" tab select the "Clear" button. 3) Select "LowerThreadPriority" and then the "Run" button. If you are not running the No CD version make sure you have the Rally CD in the drive. The game should work correctly. 4) Exit the game and select "Advanced" button. 5) Select "Create Fix Support" button and this will add a registry entry so that this fix is used every time the game is run. It will also add an item to the "Add/Remove software" list in the control panel. Thanks to: Peracer, Dave King, Mr Overshoot, srosadiuk. The file name English will change depending what language the game is installed in. Before trying any of the changes I strongly recommend that you make a back-up copy of the file. That way if you mess up the changes you can just revert back to the original file. When you open the file it will say it is to large for Notepad to open and would you like to open it in Word-Pad instead. Click yes and the file will open. Scroll down and you will see lots of text varying from car names, driver names and even the menu details. You can change any of this text! I have changed the writing that is underneath the key when you start the game from "Main Menu" to "Turn the key and get driving!". You can also change the names of the cars in just the same way. When you have made all your changes save the file and exit. Then run the game to see what your changes look like! For people who get bored of the in-game music, or those who don’t like it, can change it by using winamp (that’s what I used) to the diskwriter plug-in, and taking any MP3 that they want to use to and playing it. That will automatically convert it to wav, and then they can rename that wav to between 06 – 15, and copy to the /rc/files/music folder. The menu music is 02 – 05, the rest are all in-game music. Originally encoded in 22,050. Replacing the files with 44,100 makes the rc folder bigger, but game play quite a bit more enjoyable. When I first got the game it kept crashing every time I started a stage. 3) Pressing Ctrl + Alt + Del and closing all the programs running in the background except Explorer and Systray every time I play the game.